As springtime arrives and we get closer to Easter, many Christians begin talking about “Holy Week.” So what is Holy Week, and why does it matter? Very shortly after the beginnings of Christianity, followers of Jesus who lived around Jerusalem would gather and visit the places that had shaped the end of Jesus’ earthly life. Over the centuries, this practice of remembering the last days of Jesus’ earthly life spread throughout Christianity – and it is this time of remembering that we call “Holy Week.” Holy Week recalls the events of the week that led up to the death and resurrection of Jesus Christ. Over the years, this week has been considered the most important and holy time in the life of the church—especially what is known as the “Triduum” — or Great Three Days — of Maundy Thursday, Good Friday, and Easter morning. Two thousand years later and half a world away, we continue this ancient and holy practice Spirit of Joy! Lutheran Church. Many of the elements of our Holy Week worship have been used by Christians since at least the year 400 ad, and continue to be used by Christians around the globe. Join us for our worship during Holy Week, as we contemplate the suffering, death, and resurrection of Jesus Christ. Palm Sunday marks the beginning of Holy Week. 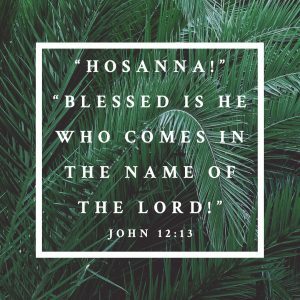 We rejoice with the crowds as Jesus enters into the city of Jerusalem, waving palms and shouting “Hosanna!” At our 10:00am service (weather permitting) we will begin worship at the outdoor chapel and then move inside. As the service continues, we hear our first reading of the Passion story – the story of Jesus’ crucifixion. Worship on April 14 at 10:00 am. Maundy Thursday takes its name from the Latin word for “commandment,” as we remember when Jesus told his disciples, “A new commandment I give to you: Love one another.” We mark the official end of Lent by receiving individual absolution, or forgiveness—the oil marking the cross on our forehead just as the ashes did on Ash Wednesday. We also remember the first Lord’s Supper and the washing of the disciples’ feet. Worship on April 18 at 6:30 pm. Good Friday commemorates the day when our Lord gave his life to save us from our sins. It is a very humbling service, as we contemplate the cost that Jesus paid for our redemption. This is the one day out of the church year when it is not appropriate to celebrate Holy Communion. On this day the body of our Lord is broken on the cross—not at the table; and on this day no celebrations are appropriate. Worship on April 19at 6:30 pm. Easter Sunday is the day of the resurrection – a joyous celebration of God’s victory over sin and death. On April 21 at our 6:30am service we will hear the story of our salvation, and greet the rising sun as we celebrate the resurrection. The Sunrise Service will begin at the outdoor chapel, and is a deeply moving experience of the power of God. At 10:00am we will have a service of resurrection joy.